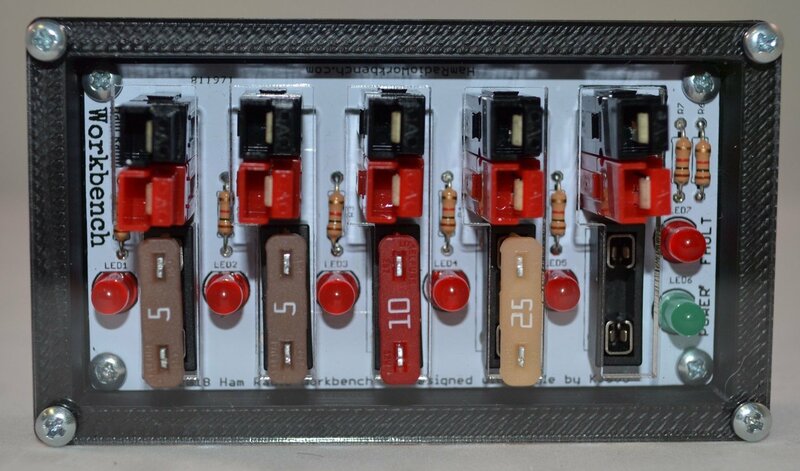 This is the case for the Ham Radio Workbench Podcast 12V Power Strip Project. The base of this case is made from 3D Printed UV resistant ABS plastic. The lid is laser cut high quality clear cast acrylic. This allows you to still be able to see the status of the LEDs and admire your work of a job well done! The case includes vents on the lower short sides and bottom to allow for airflow through the case. Case includes Base, top, and 8 screws. If using the low profile ATC fuses. they are still accessible though you may need to use a fuse puller or needle nose pliers to firmly grab a hold of to remove and replace. Standard ATC fuses recommended. Due to the LEDS I cant get the lid any closer to the fuse holders. The lid of this case is shipped with a brown paper backing on the acrylic front and rear to protect from scratching. This will need to be removed before installation. This case is made to order. When we first release these type of cases we generally get a small backlog. We run multiple printers here in the shop and can normally work through this pretty quick. Please allow a couple days for shipping. They go out in the order that they were received.